The Golden State Warriors picked up their 2017-18 championship rings and a win on the opening night of the NBA season. 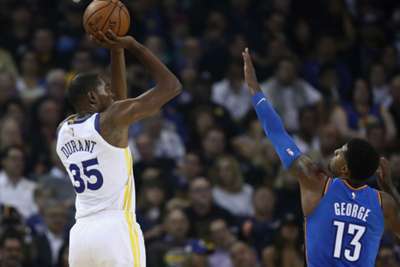 Golden State squandered a double-digit half-time lead but re-took control in the fourth quarter and held on for a 108-100 win over the Oklahoma City Thunder on Tuesday. Stephen Curry led the way with 32 points while Kevin Durant recorded 27. Paul George registered a team-high 27 points for Oklahoma City. In their place, Oklahoma City started Dennis Schroder and Terrance Ferguson in the backcourt. Schroder tallied an inefficient 21 points while Ferguson did not really contribute much at all. Veteran journeyman Raymond Felton was also unimpressive in his 14 minutes. Schroder and Ferguson will be key pieces off the Thunder bench moving forward but their impact decreases when they are in the starting lineup. The Warriors seemed to score whenever they wanted. They continued to get to the basket with creative off-ball cuts and screens while also finding shooters for open three-pointers. The Warriors could not keep it up after half-time, though, as they went through a dry spell in the third quarter which let the Thunder back into it. They struggled with turnovers, as well, as they finished with 20 in the game. Golden State also received a contribution from an unlikely spot on the floor as young centers Damian Jones and Kevon Looney combined for 22 points. Patrick McCaw's holdout continues, but his absence was barely noticeable on Tuesday. The 22-year-old guard missed the season opener as he is a restricted free agent and has yet to sign a contract with Golden State. But, the Warriors had multiple options to fill his role. Quinn Cook played 13 minutes and went one-for-two shooting from the field while Shaun Livingston continued to be a valuable third-guard off the bench. Golden State also have rookie Jacob Evans, who received a DNP in the game. McCaw averaged four points and 1.4 assists in 16.9 minutes while shooting 23.8 per cent from three-point range last season.